So I need to install either one of the RC versions of Visual Studio OR the 90 day evaluation version of Windows 8 version! 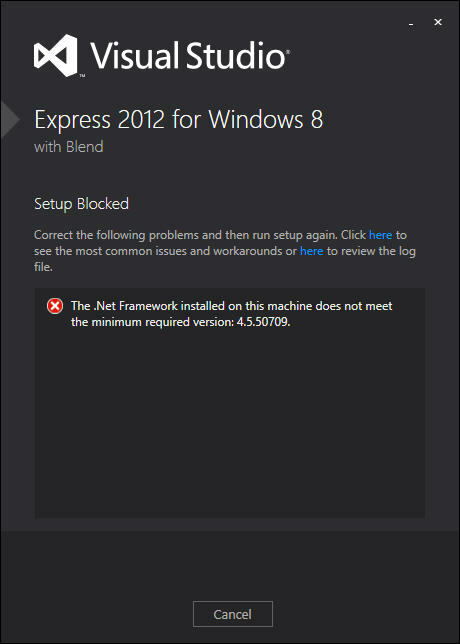 I will choose the Microsoft Visual Studio Express 2012 RC for Windows 8! That’s all guys! Happy Installing..! Shadowing : Creating an entirely new method with the same signature as one in a base class. Overriding: Redefining an existing method on a base class. If you want to read more regarding this, just follow this MSDN topic. Solution: I have fixed this issue in a different situation, just read in my previous post. The form template is trying to access files and settings on your computer. 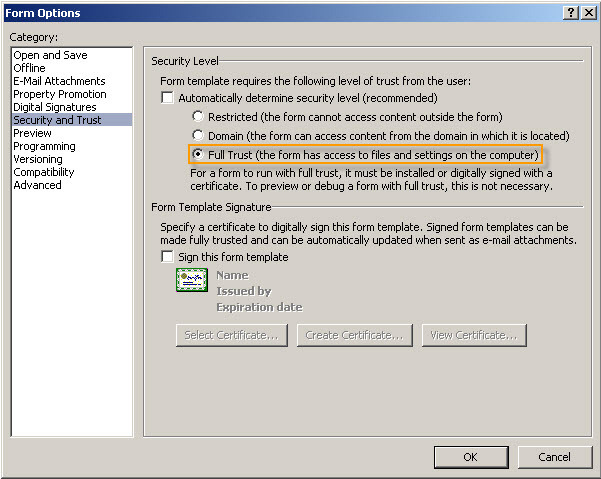 InfoPath cannot grant access to these files and settings because the form template is not fully trusted. For a form to run with full trust, it must be installed or digitally signed with a certificate. If we need to access the form from SharePoint, we need to be digitally signed the form even it is fully trusted. This is pretty simple, but we have to do this process after publishing the form on SharePoint only. Here are the steps. This will work only for you (author), If you want give access to all users you have to get the digital signature from 3rd party vendors and signed the form. Request for the permission of type 'System.DirectoryServices.DirectoryServicesPermission, System.DirectoryServices, Version=2.0.0.0, Culture=neutral, PublicKeyToken=b03f5f7f11d50a3a' failed. I have faced this kind of security level errors while creating a web parts using Active Directory(AD) and you can read this in my previous post. 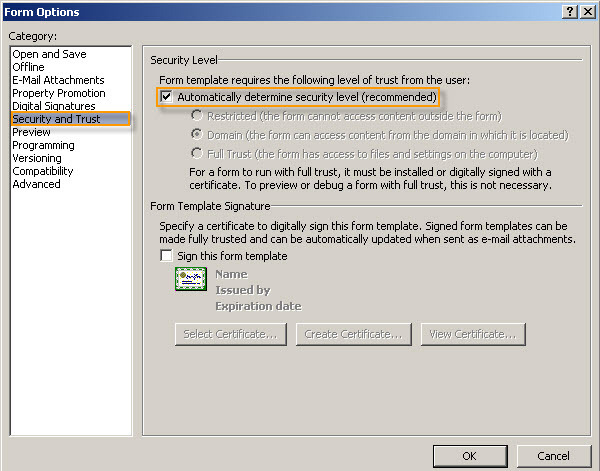 The security levels determine whether a form can access data on other domains, or access files and settings on a user’s computer. If you need more info about this, just click here. That’s all, you can access the Directory Services programmatically and display in your InfoPath form. 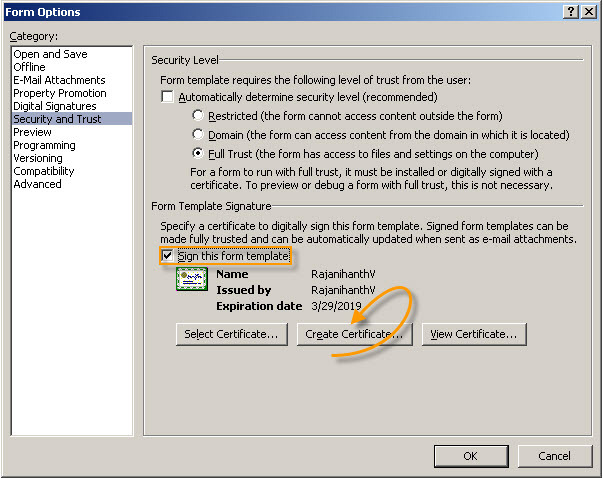 Sometimes you will be getting another error after fixing this (probably after publishing to SharePoint), to solve this problem we just need to specify the digitally signed certificate for this form. Check out the error message here. Both are treated differently @ runtime but same in the compile time, so can’t be overloaded. Both are passed by references except ‘ref’ requires that the variable to be initialized before passed. The output is same: 2, but we have to assigned the variable before used otherwise we will get an error.